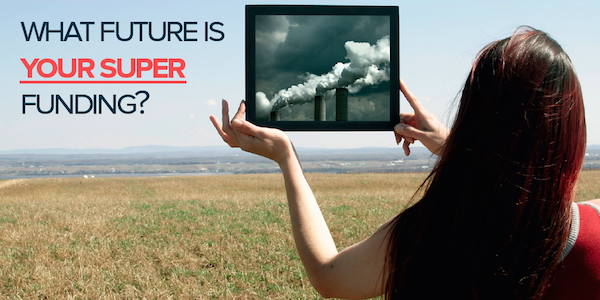 Australia is the world’s biggest coal exporter, digging up hundreds of millions of tonnes each year. If our national carbon footprint were calculated to include emissions from exported coal, it would almost triple. As well as driving dangerous global warming, coal mining also causes local environmental havoc, including the destruction of forests and farmland, reduced water availability and quality, and toxic air pollution. We have identified over $11 billion worth of loans to the Australian coal mining sector from 2008 to 2016, with $3.7b coming from Australia’s big four banks. Maules Creek is a massive open cut coal mine near Boggabri in NSW. Having destroyed part of NSW’s Leard Forest, the Maules Creek project has been the target of strong and sustained community opposition due to its horrific environmental impacts.. The mine’s owner Whitehaven Coal financed Maule’s Creek through a $1.2 billion loan in December 2012, which was led by ANZ. 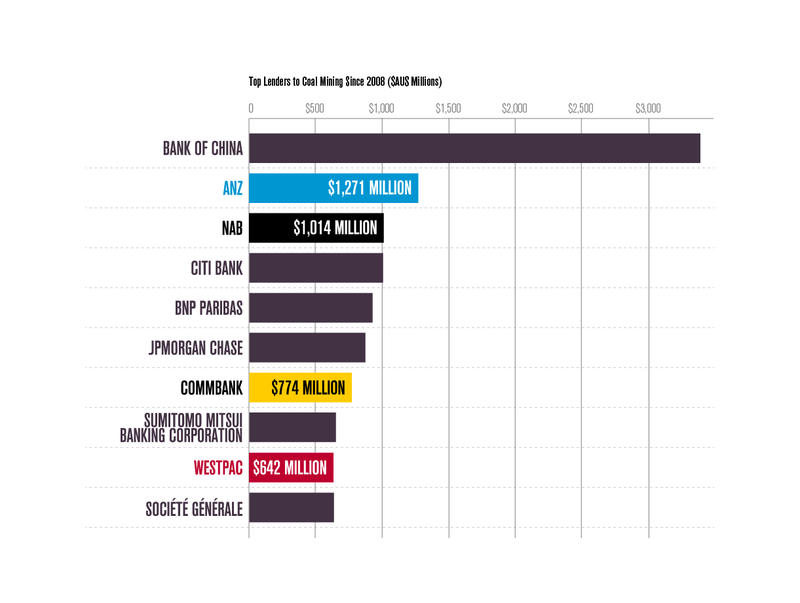 All four major Australian banks contributed to the loan, with ANZ contributing $325 million and Commonwealth, NAB and Westpac $100 million each. Despite Whitehaven’s obvious struggles and lack of social license to carry on its operations, the company attracted a $1.4b refinancing loan announced in March 2015, with ANZ, NAB and WBC each contributing $100m. 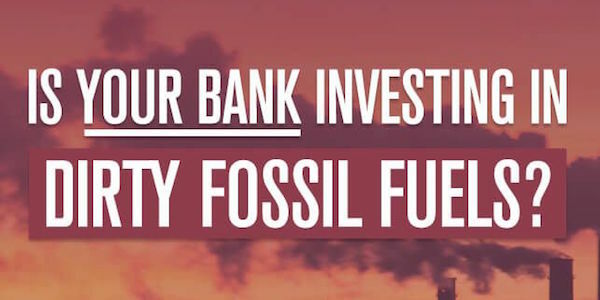 Just a few months later, it was reported that nervous lenders were already looking to exit the deal, with the huge risks associated with exposure to the coal industry finally beginning to sink in for at least one bank. Whitehaven’s appalling environmental record has been highlighted in the media, and the company wants to expand its coal mining operations at the expense of the local environment and global efforts to halt climate change. Yet ANZ, NAB and Westpac all decided to arrange a $1 billion, two year extension to a corporate financing deal for Whitehaven in August 2017. Despite the extreme environmental threats posed by digging up and burning coal, as well as clear signs that demand is falling internationally, there are proposals on the table to roughly triple Australia’s coal exports. The best known of these is Adani’s Carmichael mega coal mine, proposed to be built in Queensland’s Galilee Basin. If the Galilee Basin is opened up it would double Australia’s coal exports on its own, and account for 7% of the entire world’s remaining carbon budget under a less than two degrees warming scenario. While the environmental stakes are in the extreme, so are the financial risks. With the Galilee Basin so far from existing coal export infrastructure and many finance and commodities analysts forecasting the downward trend in coal demand to continue, there is a very real risk that Galilee Basin coal mines would become multi-billion dollar stranded assets. So far, almost 30 banks have ruled out lending to Adani’s planned Carmichael coal mine, either explicitly or through policies that restrict lending to coal mines. 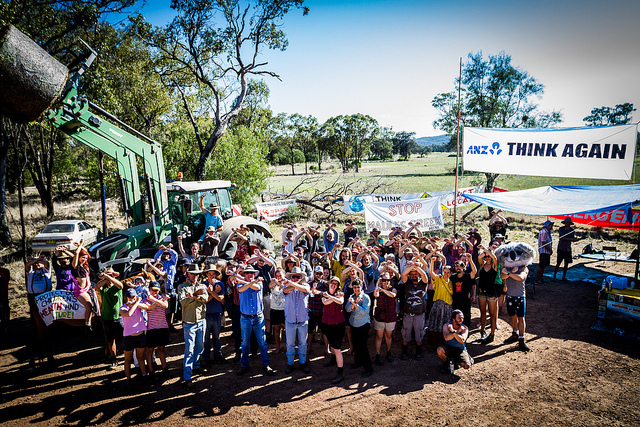 Years of community pressure has ensured none of Australia’s big four banks will lend to the project. But the mine remains a major threat, and there are many companies that could help Adani tear the heart out of the Galilee. Click here to find out more and take action.